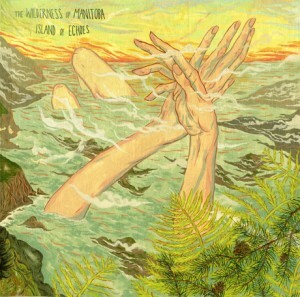 Though the frontman for The Wilderness of Manitoba has disputed that Island of Echoes is a folk album, citing instead that it contains elements of folk music, Island of Echoes is the closest approximation to chill-whispered light folk that there is. This is not folk that drives home a protest anthem or pushes emotion like the heart beating strongly, pushing blood throughout the body to keep a person alive. Island of Echoes can provide the listener with a snack for in between meals, but it doesn’t do quite enough to elevate itself past mood music. A useful comparison to this mellow, not-above-a-shout music, is past indie darlings Fleet Foxes, who also created an ephemeral and whispy environment on their first album. Bands with titles of Canadian cities and provinces are evocative of that cold tundra of rural Canada, carrying with them a need to fill that barren wasteland with their sound. The Wilderness of Manitoba should do everything to contemplate rugged men and women starving in the middle of desolation, but reaching enlightenment at the exact moment before death. The opening track, “Balloon Lamp” (another evocative image of either the only vestige of illumination being suspended by the hopes and desperation of a measly balloon, or the fleeting away of light) is that powerful atmosphere of desertion, but epiphany. The guitar is sweeping, the drums are little more than a steady heartbeat that makes its presence known, and the lyrics are… incoherent ramblings of a thirsty artist. Much of Island of Echoes is minimalist and simple. The lyrics often feel secondary or meant for rousing singalongs in end of the line bars. There is an overwhelming feeling of emptiness that is constantly enforced by the melodic, “not folk” songs and the tenor vocals that are grasping at the high notes the acoustic guitar is fiddling through.